It's official: the Virginia Center for Inclusive Communities (VCIC) has a new home in Hampton Roads. For the first time in its 83-year history, the organization has expanded its physical presence beyond its Richmond home base, setting up an office on the campus of Virginia Wesleyan University. The office represents a natural extension of VCIC’s commitment to advancing inclusion in the Hampton Roads area. VCIC has had chapters in both the Tidewater area and on the Peninsula since the 1940s, and provides numerous programs for schools, businesses, and community groups in the area each year. At the Nov. 5 press conference celebrating this historic milestone, Virginia Wesleyan University President Scott D. Miller welcomed VCIC to campus, noting that “Virginia Wesleyan’s ties run deep with the Virginia Center for Inclusive Communities, and we are honored to work so collaboratively with this like-minded organization…Our work of instilling tolerance and acceptance is never finished, and I am confident that our partnership with VCIC will produce important and lasting results." 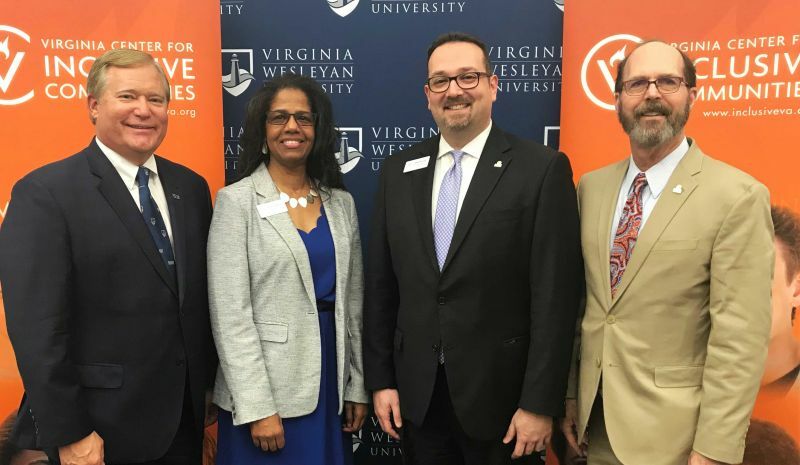 The relationship between the two organizations dates back to 1998 when VCIC became a sponsor of the Center for the Study of Religious Freedom’s (CSRF) Nexus Interfaith Dialogue program at VWU, a partnership that continues today. Over the years, VCIC has led diversity training for Virginia Wesleyan freshmen, provided facilitation training for students, faculty, and staff, and this May, partnered with the CSRF and Muslim communities of Hampton Roads to host a Ramadan Iftar Dinner. CSRF Associate Director Kelly Jackson has served on the VCIC Tidewater Chapter since 2004 and was chapter chair from 2014–2017. President Miller served as chair of VCIC's 2018 Tidewater Humanitarian Awards Dinner, and many members of the Virginia Wesleyan community have received this highly respected award, including former Trustee G. Robert Aston Jr. (2002), Trustee Emeritus George Birdsong (1997), Virginia Wesleyan’s Center for the Study of Religious Freedom (2001, Distinguished Merit Citation), former Virginia Wesleyan President Lambuth Clarke (1991), former Trustee B. Minette Cooper (2000), Trustee Mary H. Haddad (2004), Trustee Vincent J. Mastracco (2000), Robert C. Nusbaum (2013), Voices of Faith with Jim Bergdoll (2016, Jeffrey B. Spence Award for Interfaith Understanding), and Craig S. Wansink (2017). Dr. Miller is also preceded in his dinner chair role by Lambuth Clarke (1979) and Henry Clay Hofheimer (1965). VCIC’s investment in adding local staff in Hampton Roads is a key component of its overall strategy to continue growing its impact across the Commonwealth. Over the past five years, as VCIC has experienced a dramatic increase in both demand for and support of its work, it has doubled the size of its staff and increased the number of statewide programs by 142% (from 150 to over 360 programs per year). This growth comes as a direct response to significant increases in incidents of bias in the Commonwealth of Virginia. Virginia State Police reported an increase of almost 50% in reported hate crimes between 2016 and 2017, while VCIC saw a 1300% increase in requests for services after incidents of bias, bullying, or discrimination between 2015 and 2017. Twenty-eight (28) of the 202 hate crimes reported in 2017 took place in the Hampton Roads Area.